My name is Nazareth Rodriguez and I arrived in London 11 years ago after studying music promotion in Mexico. All my friends here were bartenders, so I started working as a barback to make some money. My English was so bad, but every Sunday when it was quiet I’d work behind the bar. 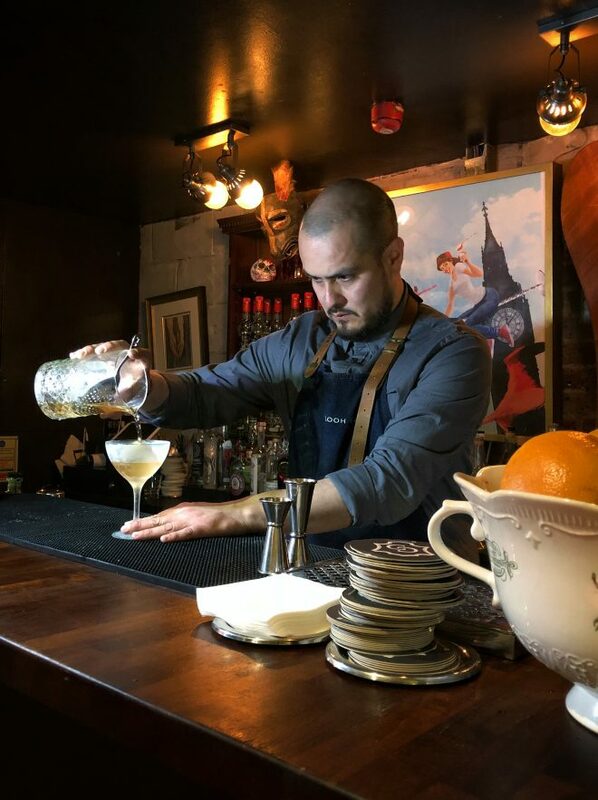 My mother is a chef, so mixing flavours comes naturally to me and I soon realised that bartending was like cooking with liquids and I loved it. I worked in many bars around London, until I became a brand ambassador for mezcal and tequila in Europe. I had a baby and with all the travelling I was not at home much, so when Artesian called I leapt at the chance to work in a bar again. I stayed at Artesian for a year, then I met up with Will from Calloh Callay one day and talked about the opportunity at Jub Jub so moved here. This place is more me and allows me to express my creativity and passion. My dream bar is a cave, like the downstairs of 1930 in Milan. It would be a small cave in Mexico city, that fits around 50 people. I’d like it to have the vibe of Gitano in Tulum where they serve incredible food and cocktails, but I would serve vietnamese food, play trip hop music and bring all the the knowledge I’ve learnt in London to the place. I spend my spare time with my kid, or otherwise spend hours cooking everything from ceviche to meatball soup to classic Italian dishes and of course my favourite… Vietnamese food. Definitively mezcal because it’s the dimensions the spirit offers depending on the agave they’ve used. You can play on dry, sweet and bitter, but it always gives a drink an edge. My favourite brand is Marca Negra. The most important thing is balance, nothing should overpower the drink. All the ingredients should be balanced and rounded. At the moment I am using a lot of Suze. I recently discovered it and I enjoy the sweetness and acidity that adds a very particular flavour to a drink and also it reminds me of a sweet from my childhood. You need to go and see Benjamin at 1930. I went to Milan for few days and every single day I went back to 1930. Also visit Maria at Gitano in Tulum.